America has the best health care in the world: the most talented doctors, the most sophisticated medical technology. But we don’t have the best health care system. Thousands of people suffer from preventable sicknesses or die prematurely each year because they don’t have access to affordable care. Health care costs are high and escalating, putting a strain on families and businesses. A failure to focus on initiatives that would cut costs—such as the promotion of preventive medicine and investment in efficiency-boosting health systems technology—means that health care dollars are not being spent as well as they could be. Our health care system is broken, and we need to fix it. The Center for American Progress has a plan for health care reform that would guarantee affordable, valuable health coverage for everyone. Here’s a look at America’s health care crisis by the numbers. 44.8 million: Number of Americans without health insurance, according to 2005 U.S. Census Bureau estimates. 15.3: Percentage of the U.S. population that lacks health insurance. 16 million: Number of people who are under-insured: despite having coverage, they don’t have adequate protection against health costs. 18,000: Number of people who die prematurely each year because they lack health coverage, according to the Institute of Medicine. 10-15: Percentage by which the mortality rate of uninsured people could be reduced if they were provided health coverage. 35: Percentage of uninsured adults who reported that in the last year they needed care that they did not get; 47 percent reported that they postponed seeking care because of cost during the past year. 23: Percentage of families without insurance who report spending less on other basic needs such as food and heat in order to pay medical bills. 1: World ranking of America in health care spending. $480 billion: Excess spending on health care in comparison to other OECD countries, adjusting for wealth. $2 trillion: Health care spending per year as of 2005, or 16 percent of GDP. 7.4: Percentage by which health care spending went up in 2005. $4 trillion: Estimated amount health care spending is expected to reach by 2015, representing 20 percent of GDP. 45: Percentage of sick Britons who have access to same-day care. 31: Ranking of United States on life expectancy. 28: Ranking of United States on infant mortality. 1: Ranking of health care costs among reasons Americans file for bankruptcy. 87: Percentage by which premiums rose between 2000 and 2006. 20: Percentage by which wages grew between 2000 and 2006. 18: Percentage by which inflation grew between 2000 and 2006. $40.7 billion: Additional costs placed on and passed through the health system in “uncompensated” care of the uninsured. These costs are borne by everyone in the form of higher premiums for the insured and higher taxpayer costs to support safety net providers. $922: Additional amount families had to pay on their health insurance premiums in 2005 due to the cost of health care for the uninsured; individual health insurance premiums were $341 higher. $768: Amount by which the average annual health premium for a family of four ($11,480) exceeds a minimum wage worker’s annual earnings of $10,712. $5.2 billion: Amount General Motors paid for health benefits in 2004—more than it paid for steel. $1,525: Amount General Motor estimates that health care costs add to the selling price of each new car it produces. 69: Percentage of businesses that offered health benefits to at least some of their employees in 2000. 61: Percentage of businesses that offered health benefits to at least some of their employees in 2006. 6: Factor by which administrative costs of the U.S. health care system are higher on a per-person basis than costs in comparable nations. $100 billion: System-wide savings that could result every year from harnessing information technology like personal electronic health records and electronic prescribing. $65 billion to $130 billion: Estimated economic value the United States could gain in better health outcomes if all Americans had health coverage. 75: Percentage of health care costs that result from chronic diseases, many of which are preventable or can be treated before people are very sick. 1-3: Percentage of our health dollars spent on prevention. $1 billion: Annual amount that could be saved by providing flu vaccines to all elderly Americans. $1 trillion: Amount that could be saved in Medicare spending over 25 years if our national obesity level returned to 1980s obesity rates. 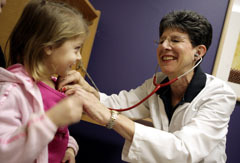 90: Percentage of Americans who believe the U.S. health care system needs either fundamental changes or a complete overhaul, according to a February 2007 CBS News/New York Times poll. 64: Percentage of Americans who say it should be the federal government’s responsibility to guarantee health insurance for everyone, according to a February 2007 CBS/New York Times poll. 55: Percentage of Americans who say that guaranteeing health insurance for all Americans is the top domestic policy issue, ranking far higher than immigration or cutting taxes, according to a March 2007 CBS/New York Times poll. America’s health care system costs too much and leaves too many people without affordable coverage. CAP’s plan for health care reform focuses on three priorities: making coverage affordable for all, improving the value of coverage for all, and financing the investment necessary to achieve a seamless, high-quality health system. Americans deserve a better, fairer, more efficient health care system. Reform will be one of this generation’s greatest challenges, but it’s one that U.S. leaders must take up.